SculpSure™ is an innovative hyperthermic laser treatment that can trim excess fat pockets around the body. On average Sculpsure™ treatment can last as little as 25 minutes. While individual results may vary, many patients see results within the weeks following the procedure. Fat deposits often form as a result of weight gain or aging and prove difficult to remove for patients. Despite maintaining a consistent diet and exercise plan, many struggle to burn off those final layers of fat. SculpSure™ is designed to eliminate stubborn fat deposits without extensive downtime or recovery. This laser fat removal treatment can target numerous areas of excess fat to produce firm contours, including the abdomen, flanks, back, inner and outer thighs, and arms. SculpSure™ is a non-surgical body contouring treatment that utilizes laser energy to eliminate fat cells from the body. SculpSure™ is completely non-invasive and requires minimal healing time. Unlike traditional liposuction techniques, SculpSure™ treatment results in little swelling, bruising, or recovery. If you are looking to reduce the appearance of stubborn fat without undergoing surgery, then SculpSure™ may be ideal for you. Patients should be in relatively good shape and close to their ideal body weight, as SculpSure™ is not meant to achieve substantial weight loss. The midsection, flanks, arms, thighs, legs, and back can all be treated with this non-invasive laser treatment. 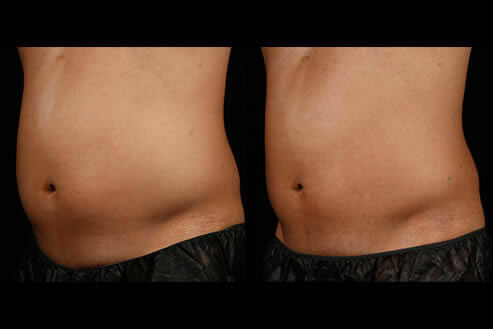 Your SculpSure™ procedure will last approximately 25 minutes, on average, and can yield long-term fat removal results. Completely non-invasive, Sculpsure has become increasingly popular for its innovative technology to sculpt and define troublesome areas of fat with no downtime. Check out the amazing before and afters of patients who have undergone Sculpsure treatment below. Individual results may vary. How does SculpSure™ laser fat reduction treatment work? SculpSure™ uses applicators that deliver precise laser energy to the target area(s). These applicators are placed above the treatment site(s) and held in place with straps. Heat energy is then delivered to disrupt excess fat cells, while the SculpSure™ machine provides a cooling mechanism to the surface of the skin, minimizing patient discomfort. After being exposed to SculpSure’s™ laser energy, fat cells begin to loosen and detach from surrounding tissue. Your body then eliminates these excess fat cells over time for long-lasting results. Is SculpSure™ different than liposuction? Yes! SculpSure™ uses non-invasive techniques to achieve laser fat reduction results. During traditional liposuction, incisions are made in the skin to insert fat-suctioning cannulas. Patients usually experience significant swelling and bruising, as well as longer healing times. Additionally, anesthesia is required for liposuction patients. Those undergoing SculpSure™ treatment do not require incisions, stitches, or scars, as the SculpSure™ applicators are instead placed above the skin. This results in less bruising and swelling around the treatment area(s) after your SculpSure™ procedure. Moreover, SculpSure™ patients do not require anesthesia. How long is recovery after undergoing SculpSure™? SculpSure™ patients can return to their daily activities immediately after undergoing laser fat removal treatment! You do not need to take off of work to recover, as post-procedure bruising is usually mild and subsides within a few days. SculpSure™ produces long-term body sculpting results! Patients typically begin to see SculpSure™ results within a few weeks of treatment, with continued results possible in the months following your procedure. After fat cells are eliminated naturally by your body, they cannot return. A healthy diet and exercise plan is recommended to maintain optimal results. Who can I talk to about SculpSure™? Our SculpSure™ physicians offer personalized treatments that are tailored to your individual needs and goals. To schedule a SculpSure™ consultation, give us a call at 844-567-LIPO.